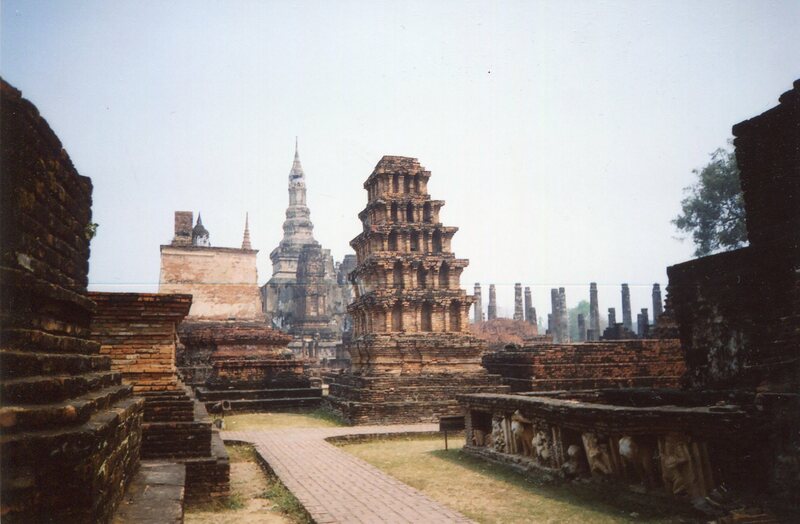 Hang out in Sukhothai long enough, and you might find it more enchanting than Angkor Wat. We can begin to see why by exploring its center, Wat Mahathat. Angkor Wat’s scale is overwhelming. Wat Mahathat glistens with lots of human-scale buildings. Their varied forms are so lithe that a walk through the place can make you feel that you’re floating in the heavens. Let’s spread our wings for a few minutes. 1. 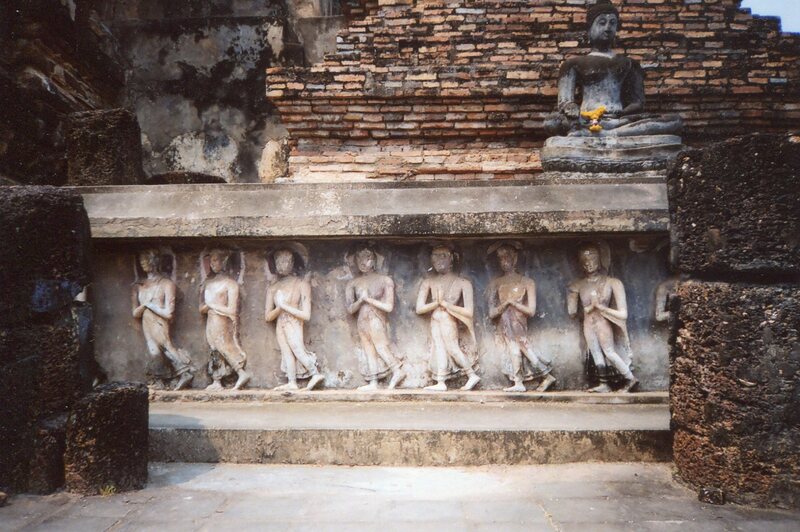 One of Sukhothai’s most popular forms is the lotus bud shape at the top of the central stupa (a stupa is a shrine that houses a relic of the Buddha or a deity–it was adapted from burial mounds in ancient India). It has a round, bulbous bottom, and it slowly becomes narrower and steeper until it ends in a sharp point. This form spread to other stupas, like this one in Si Satchanalai, a satellite town about 40 miles north of Sukhothai. Carol Stratton and Miriam McNair Scott felt that these lotus bud towers formed a circuit that joined the spiritual powers of the relics in the shrines and the king. If the locals believed that, political and spiritual powers were associated with this delicately curving vegetal form. Nature’s powers are tamed and made beautiful. 2. Eight smaller towers surround the central spire, and they make the place dance. Four are in the cardinal directions, and they’re in a Khmer style, with three tiered roofs stacked on each other. Each tower has niches for Buddha statues, and inside the first roof are scenes from his life. The other towers are in the corners. 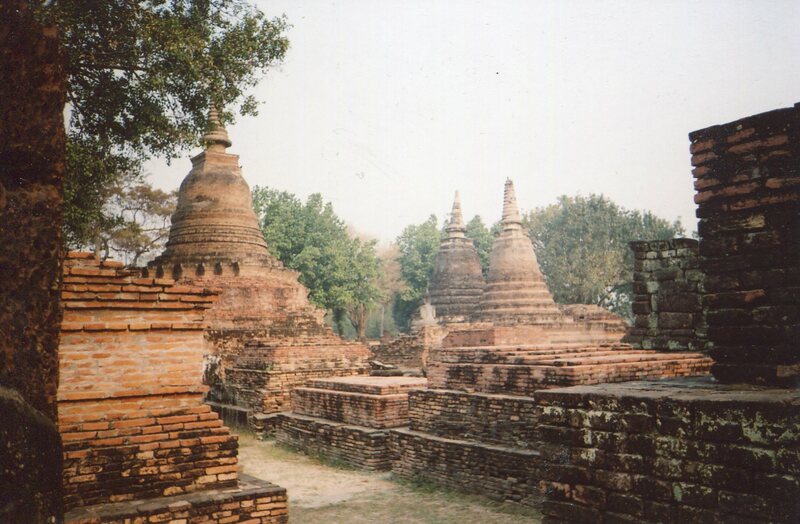 They’re crowned with narrow and elongated bell stupas that were adapted from Sri Lanka. These spires thus alternate with the more massive Khmer shrines. 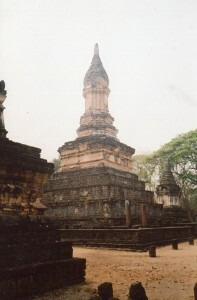 Above, you can see the Sri Lankan style shrine on the left, and the Khmer design on the right. When this multicultural blend of forms was new, it was covered with white stucco. It must have looked like it was hovering in the clouds. 3. All the towers share a platform that’s 4 to 5 feet high. As people ambled around it in stately processions, the spires’ parallaxes slowly shifted, and bestowed an infinite variety of perspectives that blended into views of divine grace. People could have looked down, and seen these equally graceful figures ambling with them. 4. Wat Mahathat has a forest of other shrines that surround the central stupa. It originally had 5 ponds, 10 meeting halls and over 200 shrines. 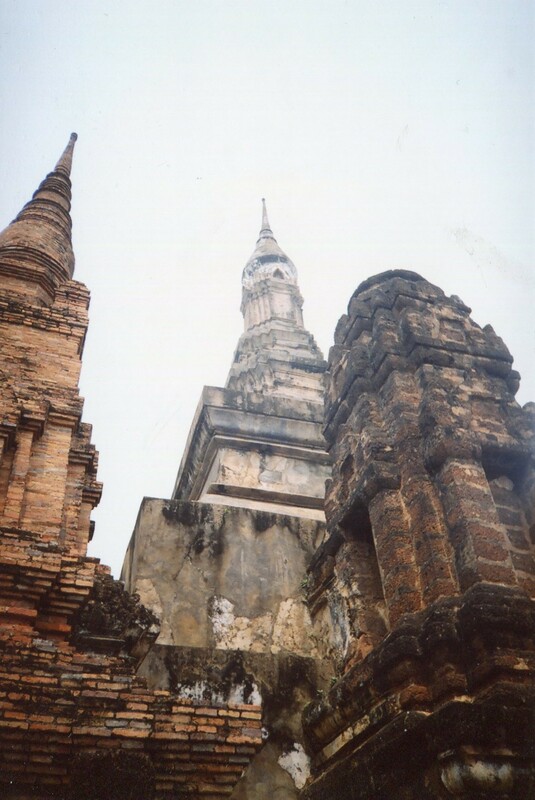 Many are supposed to have housed ashes of Sukhothai royalty. Each shrine is unique. So as you stroll around, hundreds of forms slowly mix with each other, and with the central tower. All these light forms dance with each other as you explore them. They bless you with a spiritual landscape that reflects the Buddha’s compassion. 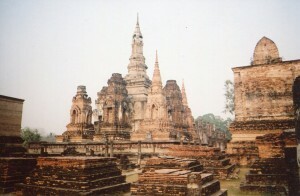 Sukhothai became independent from the Khmers in the thirteenth century. Much of Wat Mahathat and most of the central spire were initiated by King Lu Thai in the 1340’s. So Thais were perfecting their aesthetics early in their history. These playful forms spread beyond the ritual center, and graced the whole town and its hillsides. 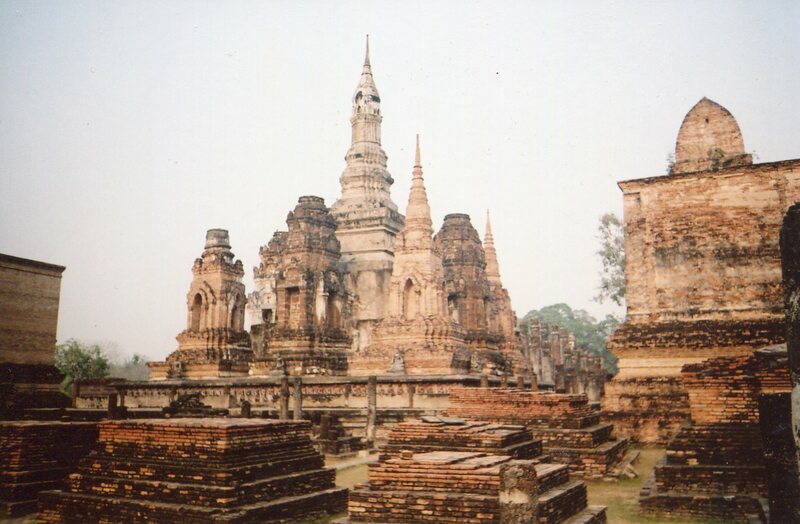 We’ll see this in future posts (including the updated series on Sukhothai from January 2013). 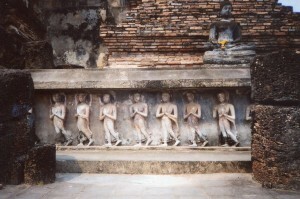 Sukhothai Buddha, a Thai Ideal of Beauty and Order.